Style 123 Dixie is a very heavy 12 oz cotton duck canvas with substantial texture and tooth. It has been double acrylic primed on one side, so you can skip the priming step and paint away! 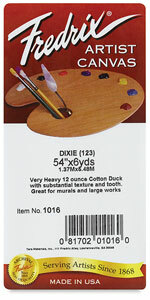 Perfect for floorcloths, murals, and other large works.